A spell of President's rule loomed large in Delhi as the political deadlock continued over formation of a government in the national capital even eight days after announcement of outcome of the election that returned a hung verdict. Months after severing ties with the Congress on the Sri Lankan Tamils issue, DMK chief M Karunanidhi today ruled out any alliance with its former ally for the 2014 Lok Sabha poll. Terming BJP's prime ministerial candidate Narendra Modi as Hitler and SP supremo Mulayam Singh Yadav as Mussolini, Union Steel Minister Beni Prasad Verma today alleged that the two leaders have a tacit understanding to polarise votes. 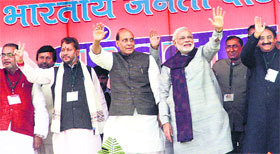 Modi today mocked at Congress vice-president Rahul Gandhi's effort to muster support for the passage of the Lokpal Bill. He said if his (Rahul's) heart really ached for it, why the Congress was not implementing the Lokayukta Act brought in by the previous BJP government in Uttarakhand. Rejecting the Jan Lokpal Bill, the Aam Aadmi Party (AAP) today termed the Central Government’s version of the bill “farce”. The bill awaits nod from the Rajya Sabha, where it is slated for discussion tomorrow. Rubbishing Aam Aadmi Party leader Arvind Kejriwal's contention that the Lokpal bill under consideration in Parliament was weak, Anna Hazare today said "if anyone feels there are shortcomings in the bill after it is passed, they should fast for it." Union Minister for Labour and Employment Sis Ram Ola, 86, died at a Gurgaon hospital today after a prolonged illness. More than three months after the communal violence in Muzaffarnagar and adjoining districts rendered thousands of people homeless, the displaced people lodged in relief camps here refused to return home fearing for their safety. Batting for bringing flexibility in UPA's flagship NREGA, Union Minister Jairam Ramesh today said the scheme has failed to achieve the three objectives of wage employment, creating community assets and empowering gram panchayats at the same time in any state. Breaking its silence on the Supreme Court order banning homosexuality, the Bharatiya Janata Party (BJP) has said it favours the verdict and will not support any “un-natural act”. The Bharatiya Janata Party (BJP) polling 2 per cent less than the 2008 assembly elections in Delhi has triggered a debate on the efficacy of the Narendra Modi factor. Several states have opposed a no detention policy under the Right To Education (RTE) Act, 2009, which allows the students to move to the next class till Class 8, irrespective of their academic performance. The draft Andhra Pradesh Reorganisation Bill, 2013, is caught in a tug-of-war in the Andhra Pradesh Legislative Assembly. A copy of the draft Bill reached the Assembly on Friday, but it could not be tabled because of the adjournment following the din created by Telangana and Seemandhra MLAs. The Vishwa Hindu Parishad and the Bajrang Dal have threatened to launch an agitation against actors Johnny Lever and Nagma after they featured in a newspaper advertisement propagating Christianity. The driver of the ill-fated Hyderabad-bound Volvo bus was overstressed and there were fire crackers inside the vehicle, according to findings of an investigation that probed two recent road mishaps in which 52 persons were killed. Chief Minister Parkash Singh Badal and his counterpart in Pakistan Shahbaz Sharif today agreed to promote peace, harmony and economic growth. You bet you will never repeat the folly of shaking hands with an oversized kabaddi player. The sheer excitement of watching a gut-wrenching contest may have got you a little carried away, but the lasting pain of a crushed, sore hand will remind you for a week that it might be exciting, but it's a big mistake. The Income Tax department has attached all assets of cash-strapped Kingfisher Airlines for failing to remit taxes amounting to Rs 350 crore, a senior official said on Sunday. In a far-reaching verdict against the Haryana Financial Corporation (HFC), the Supreme Court has ruled that no right to property would be created in the absence of a registered mortgage deed and handing over of the title deed. All of us know that the wheels of justice turn slowly but grind exceedingly fine. A case of criminal breach of trust involving 65 grams of gold and two small time businessmen has re-defined this speed - 19 years for crossing the FIR stage - making a mockery of the vow taken by successive law ministers at the centre to ensure the disposal of each case in just 2-3 years and thereby wipe out the over 30 million cases pending across the country. One person was killed and four others injured today by suspected anti-talk NDFB (Songbijit) insurgents who exploded two grenades and fired indiscriminately at Molandubi Market in Assam's Kokrajhar district, the police said. Lt Governor Najeeb Jung on Saturday sent a detailed report to President Pranab Mukherjee about the current political situation and mentioned that government-formation in Delhi was not possible now. The tenure of the current assembly will end on December 18 and President's rule has to be imposed after that if a government is not put in place by then, top officials said. They said Jung was now waiting for a directive from the Centre. The Aam Aadmi Party (AAP) had yesterday put the onus on Congress and BJP for taking its support to form a government by putting forth 18 conditions and wanting to know their views on them, a move seen as an attempt to rebut criticism that it was shying away from taking responsibility. The BJP, along with its ally Akali Dal's one seat, has 32 MLAs in the 70-member House while AAP has 28 seats followed by Congress' eight. JD(U) won one seat while the Mundka seat went to an Independent. The BJP had declined to form government citing lack of majority following which Jung had invited AAP chief Arvind Kejriwal to discuss government formation. In a surprise move, Congress had on Friday submitted a letter to the Lt Governor extending "unconditional support" to AAP to form government. the BJP on Sunday attacked the AAP saying the party was not interested in forming the government as it will not be able to fulfil the promises made in its manifesto. The AAP had promised to cut power tariff by 50 per cent and supply 700 litres of water free to each household daily. The AAP is scared of being exposed. There are apparent contradictions in its stand as, on one hand, AAP leaders are criticising other political parties and then it is writing letters to them about support in forming the government. Karunanidhi made the announcement in his concluding remarks at the meeting of the party's key decision-making body, the general council, to a rapturous applause from members, reflecting the anti-Congress mood in the party ranks. Party sources claimed Karunanidhi hinted that the DMK might not forge an alliance with the BJP also, but the leader himself made a non-committal reply on that. Sources said he had indicated that the BJP's present leadership was different from AB Vajpayee who had headed the NDA government of which the DMK was a constituent. "A committee has been formed and it will discuss and decide on the alliance," was his response to reporters' queries when asked if he still kept the BJP as an option. DMK sources present at the meeting said Karunanidhi ruled out a tie-up with the Congress, referring to the 2G Spectrum scam that has turned out to be the gravest allegation faced by the DMK in many years. Karunanidhi's daughter Kanimozhi and junior colleague and former Telecom Minister A Raja are accused in the scam. The Joint Parliamentary Committee, constituted to probe the matter and headed by PC Chacko (Congress) had recently tabled its report in Parliament amidst opposition from the BJP, the CPI and the TMC that dubbed it as a "fraud". DMK members had walked out in protest over the report. The report has given a clean chit to Prime Minister Manmohan Singh in the scam, saying he was "misled" by the then Telecom Minister Raja. The DMK has said Raja was not heard. Earlier, the general council granted complete authority to Karunanidhi and party general secretary K Anbazhagan to discuss and decide alliance-related issues for the 2014 Lok Sabha elections. "Hitler has been born in Indian politics, so has Mussolini in Uttar Pradesh. The two leaders had a friendship, and their reincarnations are the same, but of modern type," Beni alleged, while talking to the reporters here. "He (Modi) has become a dictator of Gujarat and Muslims can't dare to speak against Hitler," he said. Responding to the remarks, the BJP flayed Beni for comparing Modi with Hitler. "Before saying so, he should have thought about Modi's popularity and his stature," BJP's chief spokesman Vijay Bahadur Pathak said. "I would like to know why the Lokayukta Act brought by the erstwhile Khanduri government was not adopted by the Congress government in Uttarakhand," Modi said. He was addressing his maiden rally in the state after being chosen BJP's prime ministerial candidate here at the parade ground. He said it was time to rid the country of the Congress rule. He urged the people of Uttarakhand to make the BJP win all five Lok Sabha seats in the state in the coming General Election. "An auspicious beginning has been made. The Congress has been routed in four states, now it is time to rid the country of the Congress rule," he said. "Jharkhand, Uttarakhand and Chhattisgarh were granted statehood at the same time. While Chhattisgarh has taken a giant leap, Uttarakhand and Jharkhand have been left behind due to experimentation with different parties and leaders. The people of Chhattisgarh voted only for the BJP. Now, repose faith in the BJP and we will resolutely work to fulfil your dreams. Together, we will work to help Uttarakhand reach greater heights," he said. Giving success mantra for Uttarakhand, he said harnessing water resources and promoting tourism could spur development for the state. "The state has vast water resources. These can be harnessed to make power, but the government lacks time for innovative thinking. Similarly, spiritual economic zones (SEZs) could be developed to attract tourists," he said. BJP national president Rajnath Singh also exhorted the people to push the Congress out of power and deliver the five parliamentary seats from the state to the BJP in the 2014 General Election. AAP chief Arvind Kejriwal hit out at Congress Vice-president Rahul Gandhi, saying the Congress was misleading people on the Lokpal legislation. He said the bill passed by the Lower House was “unacceptable” and only going to benefit Rahul and his party. The remark comes a day after the Gandhi scion, in a rare instance, pitched for his government’s Lokpal publically. On the government formation in Delhi, the AAP is confident of outrunning others if Delhi goes to elections again but the rift between its leader Arvind Kejriwal and his mentor Anna Hazare is deepening by the day. While the social activist has announced support to the bill after five days of fast at Ralegan Sidhhi, the AAP national convenor contested that the Lokpal Bill, in its current form, did not have the teeth to act against the government and would instead deter whistleblowers to raise voice against corruption. Calling for a strong anti-corruption ombudsman, Kejriwal pointed out that the government would not only have a say in the selection of the Lokpal, but would also control its functioning with the Central Bureau of Investigation (CBI) being kept out of its ambit. This stands contrary to the demand previously made during the Jan Lokpal movement led by Hazare in 2011. Though AAP leader Gopal Rai who was fasting in solidarity with Hazare today called off his fast, Kejriwal said the AAP would continue its agitation for a strong ombudsman. "I have read the provisions of the bill properly. If you (Kejriwal) think the bill has any shortcomings, fast for it," Hazare, whose fast for passage of Jan Lokpal Bill entered sixth day today, said while talking to reporters here. The anti-graft crusader said several of his expectations from the legislation have been met and he expressed satisfaction over the bill which has been presented in the Rajya Sabha. 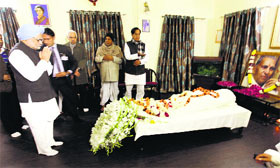 Ola, a five-time Lok Sabha MP from Jhunjhunu in Rajasthan, breathed his last this morning. He is survived by wife Shiv Bai, sons Brijendra Ola and Sarjit Ola and daughter Chandrakala. The cremation will be held at Jhunjhunu tomorrow. The Tricolour flew half mast in his memory in all capitals today. President Pranab Mukherjee, Vice-President Hamid Ansari, Prime Minister Manmohan Singh, Congress president Sonia Gandhi, Rajasthan Chief Minister Vasundhara Raje and Bihar CM Nitish Kumar have expressed grief over Ola's death. The Union Cabinet met this evening to hail the illustrious career of the Jat leader by passing a resolution to that effect. In a message to Ola's wife Shiv Bai, the President said, "I am deeply saddened to learn about the passing away of your husband who was a friend and colleague of long years." Ansari hailed Ola's "long and distinguished public life spanning five decades". Sonia Gandhi said: "The nation has lost a leader of stature and rare earthy wisdom." Ola was born in a farmer's family on July 30, 1927, at Ardawata in Jhunjhunu. In 1957, he was elected to the Legislative Assembly of Rajasthan for the first time. He served the Assembly for eight terms. He was elected to the Lok Sabha in 1996 from Jhunjhunu and was re-elected four times thereafter. "No concrete action has been taken against the perpetrators who are fearlessly roaming in open. We would be killed if we get back. How can the administration expect us to leave relief camps?" rued 42-year-old Mehboob of Hasanpur village. Victims are ready to bear harsh winters in thin canvass tents but are reluctant to move back to their native villages despite state government making every possible effort for their rehabilitation. "We will die here but we will not move back," said Kausar of Bhura village in the district. Yesterday, Divisional Commissioner Manjit Singh visited the Kandhla relief camp where he was apprised by some victims about the missing people during riots and they demanded that 11 missing people should be declared dead by the district authorities. Stating that all jobs cannot be provided in areas where the youths want them, he called for encouraging migration across all states and noted with concern the "discrimination" in housing suffered by youths from Jammu and Kashmir who are employed outside the state. While initially party leaders had refused to take a stand on whether they support the order or not, BJP president Rajnath Singh has said if the government convenes an all-party meeting on the issue, his party will support Section 377 of the IPC which bans homosexuality. 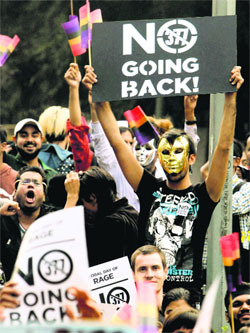 “If an all-party meeting is called, we will support Section 377 as we believe that homosexuality is an un-natural act. We cannot support it,” he said. The party has been cautious in taking a stand on the issue as many BJP leaders feel opinion in the society is divided on it. Some BJP leaders, however, appeared to be opposed to the Supreme Court order. “Section 377 of the IPC only bans sexual conduct that goes against the order of nature. A reading down of this law can be that to be born with gay tendencies cannot be against the order of nature. The court does not have to legalise or illegalise such a thing. It is not against the order of nature,” a BJP leader had said. However, Rajnath Singh’s comments are being treated as the official line of the party on the issue. “What Rajnath Singh has said is the official stand. We have a culture and tradition and this goes against it. One cannot allow a new culture of this kind,” BJP vice-president Mukhtar Abbas Naqvi said. Refuting the stand taken by Congress president Sonia Gandhi and party vice-president Rahul Gandhi, Naqvi said homosexuality was against the established norms of society. Sonia Gandhi has described the Supreme Court verdict as “disappointing”. The Supreme Court on December 11 set aside the Delhi High Court verdict of 2009, which had decriminalised sexual relationship between adults of the same gender. Though officially the attempt is to brush under the carpet an issue of decreasing vote bank in Delhi, the failure to form the government in the Capital has given an issue to the anti-Modi camp in the party. The BJP has polled 34.37 per cent votes this time, 1.93 per cent less than what it polled in the 2008 elections. Though party leaders admit that the BJP’s emergence as the single largest party in spite of a fall in the vote share was thanks to the Aam Aadmi Party (AAP) damaging the Congress more than the BJP, they refuse to see this as a failure of Modi factor. While the BJP’s rivals — the Congress and old ally Nitish Kumar — have refused to attribute the saffron party’s performance to ‘Modi wave’, the party's “below par” performance in Delhi has given voice to those who believe that the Modi factor might not deliver as much as his supporters thought. According to his detractors, in spite of a perceptible anti-Congress wave in Delhi the saffron party performed badly in places where Modi campaigned. There are reports of the BJP losing five out of the 12 constituencies in which Modi campaigned in Chhattisgarh, and three out of five constituencies in Delhi. Bastar (Chhattisgarh), where he campaigned in the first phase, saw the BJP loosing eight out of 12 seats to the Congress. The BJP’s strong showing in Madhya Pradesh and Rajasthan is due to Chief Minister Shivraj Singh Chouhan's effort and anti-Congress wave, respectively, detractors say, adding that some of Modi’s rallies, for example in Bhopal, did not enthuse the crowd. His supporters believe that the assembly results has only validated Modi's effectiveness, while his detractors are of the view that if he was such a big factor, the BJP should have done better in Delhi. Internal assessments after the polling suggested the party's failure to connect with young voters in spite of a high-voltage Modi blitzkrieg ahead of the elections. Besides, the detractors believe that Chouhan and Raman Singh — winning their respective states for the third time — have robbed the Gujarat Chief Minister of his standalone position in the party. 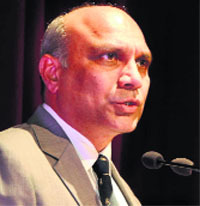 “A committee constituted to review the policy has submitted its report to the ministry, incorporating several states opposition to it,” Union Minister of Human Resource Development MM Pallam Raju said here today. Though he did not divulge the number of states opposing the policy, the minister said state governments expressed “non-seriousness” on the part of teachers and students, who started taking examinations lightly, after the policy came into effect. “The policy was introduced after a lot of brainstorming to benefit the poor students. With many states opposing it, the policy will be reviewed in due course,” Raju said. He asserted that quality education was a concern, for which the Central Government had introduced the Rashtriya Uchchatar Shiksha Abhiyan (RUSA) to reform the higher education system. “In the 12th Five-Year Plan that runs from 2012 to 2017, Rs 22, 000 crore has been earmarked for the RUSA, of which the Centre is contributing Rs16, 000 crore. In the 13th Plan, the scheme will have a funding of more than Rs 90,000 crore,” the minister added. The Bill is expected to be tabled tomorrow, after which the Speaker will conduct a meeting of the Business Advisory Committee to fix schedule for discussion. However, it may not break the stalemate as Seemandhra MLAs have other plans. Activists of the two parties took umbrage to advertisements under the banner of ‘Power to Change India’ featuring the two actors who allegedly claimed that their lives were changed after they embraced Christianity. Johnny Lever is quoted in the ad as saying that his son, who was seriously ill, was cured after his family embraced the Christian faith. Similarly, Nagma too claims to have experienced a life change after embracing the faith. Their stories form part of a booklet which claims to carry the true stories of several people who experienced positive changes in their lives following conversion. The VHP and the Bajrang Dal allege that the advertisements were part of a wider campaign to proselytise Hindus. The investigation has said that "the driver was overstressed. He could not find brake and was assigned on double duty," Road Transport and Highways Minister Oscar Fernandes said. "There were fire crackers also in the Bangalore-Hyderabad bus," he added. In the first accident on October 30, 45 passengers were burnt alive as the Volvo bus they were travelling from Bangalore to Hyderabad burst into flames after its fuel tank caught fire on hitting a culvert at Mahboobnagar in Andhra Pradesh. The bus might have caught fire due to a spark and fire crackers might have exploded, the Minister said. In a joint statement today, they recognised the immense benefits of mutual cooperation. "The time has come when we should resolve all differences and develop strategies to eradicate poverty and unemployment for development on both sides of the border," Shahbaz said. Both the CMs resolved to pursue the matter with their respective Union Governments. The CMs agreed to facilitate exchange of delegations comprising professionals from different sectors, including agriculture, trade, industry and commerce, to encourage exchange of students and promote people-to-people through sports, cultural activities and tourism. They agreed to promote cooperation in dairy development, veterinary sciences and water management, to encourage joint workshops, training programmes and R&D projects in agriculture and allied sectors, especially crop improvement and to promote exchange of knowledge in agriculture machinery. They also agreed to pursue policies to reduce trade barriers for promotion of business. Amritsar: The SGPC raised the issue of "large-scale rejection" of visas to Sikh pilgrims by Pakistan with Pakistan Punjab CM Shahbaz Sharif who, along with his family, paid obeisance at the Golden Temple on Sunday. Sharif was honoured with a siropa inside the shrine. Even at a distance they seem enormous — someone scary, someone to be dreaded. But strike a conversation with them and they turn out as to be gentle giants. Towering in physical attributes, yet grounded in disposition. Warlike on field, yet surprisingly meek off it. The moment they speak, "hanji, ji baijee, ji paaji" start flowing, giving away the humility that comes from a certain earthiness in the soil of Punjab. Their shyness, their uneasy expressions, the uncomfortable awkwardness, the perspiration clearly tell they are in awe of the moment. It is the smell of Volini and Iodex that they have learnt to live with. For close to one month, the 14 members of the victorious Indian team have been enduring insufferable pain, creaking joints, battle-scarred bodies. But now they have Rs 2 crore to share with each other. The 'Laadi', the 'Jeeta', the 'Nikka' of Punjab have found out how to make a fortune for themselves from this sweat-soaked, caked-in-mud legacy of kabaddi. This year, Balbir 'Billa' from Bagge village and Balbir 'Palla' from Jalalpur (both in Nakodar) have a little more of earthly possessions — a tractor each, won as awards for being the Best Stopper and the Best Raider, respectively, in the 4th World Cup Kabaddi. They were lucky this time as the 28-year-old Mangat Singh 'Mangi', a feared stopper and winner of two tractors in the past, finally chose to take it easy. Billa does not have any illusions about this rather novel award. Ask him what he will do with it, he snaps, "sell it". From being an unemployed youth from the Nakodar belt who toiled in the fields all day, he has transformed himself into a pro kabaddi player. "A top grade player can earn as much as Rs 5 crore in a year (May-August) by playing in Canada, USA, England. Why not go for it?" he says, rather asks. But to have money one needs to have muscle. A lot of hard work, strict regimen and a super rich diet go into it. A massive amount of nuts, milk, ghee, eggs, meat, green vegetables do the trick. "You need to exercise and then have a good diet to build such a body. “During the conditioning camp they were given a diet money of Rs 500 per day," said coach Harbans Singh. The coach admitted that the professional players themselves are very particular about their diet to remain in good shape. The first impressions may be of their physique but the second ones are, undoubtedly, of their tattoos. Have they morphed from being Punjabis to punks? They have got the money, will opulence be on show through ink on their bodies? Will they indulge in showmanship when getting inked? Not quite. They go for the image of the 'Khanda', or a lion, or a symbol of Khalsa, or extracts from the scriptures. They rooted to the soil. They are the thoroughbred ones. You need to exercise and then have a good diet to build such a body. At the conditioning camp, the players were given a diet money of ~500 per day. "We have attached all assets of Kingfisher Airlines and are in the process of recovering its dues by sale and attachment of properties of the defaulter company," IT official Lokesha said in a statement here. Kingfisher House at Western Express Highway near the Mumbai domestic airport has been attached under the second schedule of the Income Tax Act, 1961. "A mere undertaking that a person would not dispose of the properties mentioned during the currency of the loan would not confer any charge on the immovable properties mentioned therein," a Bench comprising KS Radhakrishnan and C Nagappan held. "In other words, a mere undertaking to create a mortgage is not sufficient to create an interest in any immovable property," the Bench clarified. HFC had come to the SC challenging the transfer of a property by a person, who had offered it as security for a loan, to his wife despite the fact that he had failed to repay the loan amount. When Singh failed to return the loan, HFC unsuccessfully challenged the decree in the courts below contending that it was obtained by fraud to defeat his personal undertaking and finally came to the SC. The apex court ruled that a conjoint reading of Sections 59 and 100 of the Transfer of Property Act would make it clear that "when there is a mortgage other than a mortgage by deposit of the title deeds, it can be effected only by a registered instrument." Dismissing HFC's appeal, the Bench pointed out that no registered mortgage deed was executed and no title deed of the property was handed over to the Corporation in the instant case. A mere undertaking that a person would not dispose of the properties mentioned during the currency of the loan would not confer any charge on the immovable properties mentioned therein. It was way back in 1994, one Ram Dayal, a cloth shop owner in Rajasthan, filed an FIR with the police against Ghanshyam, a gold smith, under Section 405 of the IPC for not returning his three gold chains given for repairs. But Ghanshyam denied the complaint. Unhappy with the police action, Dayal filed an application before a metropolitan magistrate under Section 190 CrPC, upon which the Sawai Madhopur police investigated the complaint and concluded that the FIR was false. The complainant then filed a protest petition with the Additional Chief Judicial Magistrate (ACJM) who rejected it and accepted the police version. Aggrieved, he approached the court of Additional Sessions Judge (ASJ) who set aside the ACJM’s order and sent the matter back to the metropolitan magistrate to rehear the matter by taking into account the documents on record. The magistrate, however, stood by the earlier ruling against the complainant. This brought Dayal back to the court of ASJ, who this time agreed with the magistrate’s findings. Upon this, he approached the Rajasthan High Court under Section 482, challenging the ASJ’s verdict. The HC ruled that a prima facie case of criminal breach of trust was clearly made out against the accused and remanded the matter back to the trial court for a fresh decision in the light of the statements made by two witnesses and evidence on record. This prompted the accused to come to the SC in 2009, challenging the HC ruling. A Bench comprising Justices SJ Mukhopadhaya and V Gopala Gowda delivered its verdict on December 12, upholding the HC ruling despite the fact that notice could not be served on the complainant whose whereabouts were not known. Now, the case would go back to the trial court for “adjudication on merit.” In the absence of the complainant, the Rajasthan Government would fight the case. Six militants riding three motorcycles swooped on the market in Kajigaon police station area and opened indiscriminate fire at a pharmacy there, killing its owner Motleb Sekh (25) on the spot around 2.45 pm, the police said.